"I would like parents who have daughters to look straight in their eyes and tell them, 'Yes, a woman can,'" Dilma Rousseff said following her victory in Brazil's runoff election in October 2010. When she took the reins of the world's fourth largest democracy on Jan. 1, 2011, she became the South American country's first female President. Her win, a victory for would-be women leaders everywhere, was also a nod to outgoing President Luiz Inácio Lula da Silva, who handpicked her for the job. 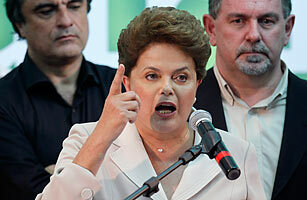 As Lula's former chief of staff, Rousseff promised to carry on the outgoing and overwhelmingly popular leader's work. "I offer special thanks to President Lula," she said in her election-night speech. "I will know how to honor his legacy. I will know how to consolidate and go forward with his work." See photos of women in power through history.